Spoiled | What YA Reading? 16 year old Molly Dix has just discovered that her biological father is Brick Berlin, world famous movie star and red-carpet regular. Intrigued (and a little terrified) by her Hollywood lineage, Molly moves to Los Angeles and plunges head first into the deep end of Beverly Hills celebrity life. Just as Molly thinks her life couldn’t get any stranger, she meets Brooke, her gorgeous spoiled half-sister who welcomes Molly to la-la land with a smothering dose of ‘sisterly love’. But in this town nothing is ever what it seems. Discovering that your father was rich and famous and, therefore, you are. It’s a story that’s been told since the time of princesses. Unlike most people, though, the Gofugyourself girls tell it well. -Molly Dix is a tomboy. -Her step-sister, Brooke Berlin, is a spoiled girly-girl. -Brooke had never heard of her father’s illegitimate child before and is furious at her for suddenly stealing the spotlight. -Brooke is viciously manipulative and a great liar. -Brick Berlin, the father, is oblivious. -Molly is having boy trouble. -Molly knows how to make friends with Brooke’s enemies. So, let me ask you: Is this going to go well? No. It is not. It is going to go horribly, horribly wrong. Will anyone come out of this savage, wicked, battle unscathed? No. They will not. They will all be terribly socially harmed. Will simple drama lead to horrendous repercussions? Yes. Horrendous repercussions. Are you going to enjoy it? Yes! Considering the marshmallow fluffiness of this type of book, I was pleasantly surprised. At first I thought that Brooke, being the selfish spoiled brat that she is, was completely superficial. But as the novel progressed and the secrets of Brooke’s past unraveled, she began to prove to me that she has depth. Molly was equally likable. I imagined that after her mother died and revealed that Molly’s father was none other than the A-list actor Brick Berlin, Molly would be in shock and sniveling. However, she turned out to be a strong heroine who fought against Brooke’s drama with some tricks of her own. 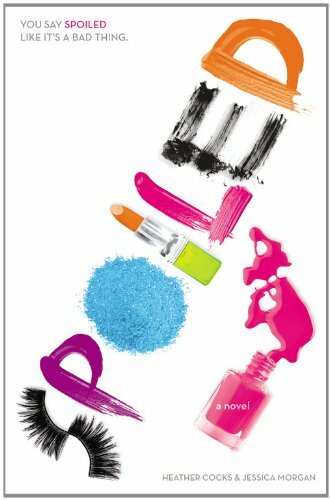 Light, hilarious, delicious, and complete with a yummy cover, Spoiled is a Hollywood-set contemporary that, if you loved Mean Girls and The Clique, you do not want to miss. 4/5 stars.